The device market continues to evolve and grow, following paths that aren’t always as obvious as one might presume. PCs were dead, and now they’re not. Tablets were taking over, and now they’re not. Phablets were only going to be for a small minority, and now they’re not. Despite the challenges, one of my roles as an analyst is to create market forecasts and try to bring some sense of order to what often seems like chaos. In the process of creating my firm’s latest predictions for smart connected devices (a term I coined while I was an analyst at IDC to describe the combination of PCs, tablets and smartphones), it became obvious to me that one over-riding factor is now driving a dramatic shift in the device landscape. In a word, “phablets,” which I define as large smartphones with screens that are 5” and greater. The phablet phenomenon has only had a modest impact so far in the US, but in many other parts of the world—particularly the fast-growing Asian markets—large smartphones are quickly become the common choice of most smartphone buyers. For some of those buyers, in fact, a large smartphone is their first true computing device and serves as their entré to the wonders of the Internet. While in the US, phablets represented just 13.1% of Q4 2014 shipments, worldwide they already captured 27% of smartphone shipments. In fact, with shipments at just over 100 million units last quarter, more phablets shipped than all PCs or all tablets for the same time period. Plus, the momentum for the category is really only just starting. Here in the US and certain other markets, the 5.5” iPhone 6 Plus finally “legitimized” the phablet market and the momentum behind it is now enormous. Not surprisingly, I’m predicting very strong growth for large smartphones and believe they will surpass 1 billion shipments in 2019. In fact, they’re the sole reason the smartphone market is continuing to grow because I believe small smartphones (those with screens under 5”) peaked in 2014, and will continue to decline through the end of the decade. Phablets are doing more than just driving smartphone market growth, however. Large smartphones have also had a negative impact on tablets. Worldwide tablet shipments barely eked out any growth last year and US tablet shipments fell between 2013 and 2014. The small tablet market (defined as those with screens from 7”-7.9”, like the iPad Mini), in particular, is already taking a beating from larger smartphones and the situation is expected to get worse over the next few years. Many people are finding that large smartphones can easily take the place of smaller tablets for most of their activities. Plus, large smartphones have the added benefit of an always-on data connection through the cellular network. 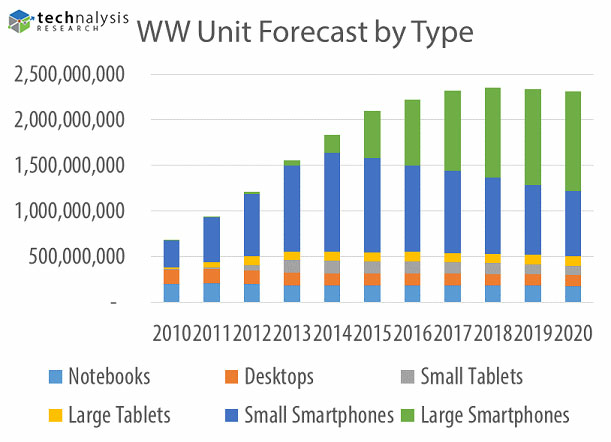 As a result, I’m forecasting that worldwide tablet shipments peaked last year and will continue to decline over the next 5+ years. Interestingly, because of this decline, I believe phablets are also impacting the PC market. When people were predicting that tablets would take over for PCs (the Post-PC Era anyone? ), the PC market suffered. Now that it’s clear that wholesale PC replacement is not going to happen, we’re seeing stabilization worldwide and even modest growth in the US PC market. Many people are discovering that PCs and large smartphones make for great companions and meet all the computing and mobility demands that most people have. The chart below summarizes my new TECHnalysis Research forecast for all the major smart connected device categories through 2020. As you can see, the phablet phenomenon is not only real, it’s reshaping the entire device landscape. You can find out more about the TECHnalysis Research forecast by reading the press release here and downloading a summary presentation of the results here.